Rangers in Zimbabwe’s Hwange national park have discovered the carcasses of 26 elephants at two locations, dead of cyanide poisoning along with 14 other elephants which were found last week. Patrolling rangers discovered the carcasses on Tuesday, according to the Bhejane Trust and the National Parks and Wildlife Management Authority. The Bhejane Trust undertakes joint animal monitoring and welfare work with the parks agency. Elephants cross the road in Hwange national park on 1 October, in an area near where the bodies of 26 elephants were found by rangers. A parks spokeswoman, Caroline Washaya Moyo, said 14 tusks had been recovered from these elephants but the others had not been recovered. She said rangers had found 16 of the elephants in the Lupande area and 10 others in Chakabvi. Washaya-Moyo said no arrests have been made and investigations were in progress. Rangers recovered 1kg (2.2lb) of cyanide and are increasing patrols in the park, she said. Cyanide is widely used in Zimbabwe’s mining industry and is easy to obtain. 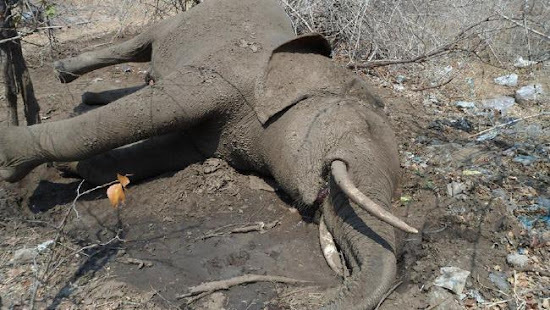 An elephant found killed by cyanide poisoning in Matusadona National Park earlier this month. “The poachers were probably disturbed by rangers on patrol, which is why some of the tusks were recovered. Cyanide poisoning is becoming a huge problem here and we are struggling to contain it,” said Trevor Lane, a founder of the Bhejane Trust and a leading wildlife conservationist. Last week, the parks agency reported that 14 elephants had been poisoned by cyanide in three separate incidents. In 2013, as many as 300 elephants died in Hwange park after poachers laced salt pans with cyanide. 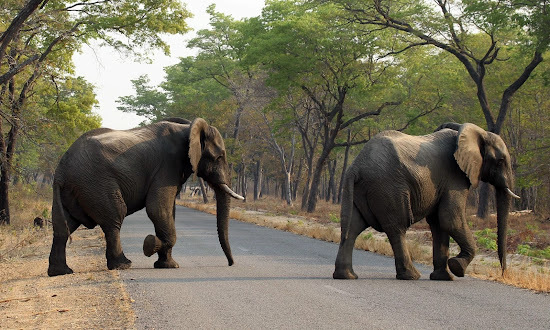 On Monday, the environment, water and climate minister, Oppah Muchinguri, blamed the increase in poaching on a US ban on hunting Zimbabwean elephants for sport. “All this poaching is because of American policies. They are banning sport hunting. An elephant would cost $120,000 in sport hunting but a tourist pays only $10 to view the same elephant,” she said, adding that money from sport hunting was crucial in conservation efforts.